I was immediately drawn to Flowers are Calling, written by Rita Gray and illustrated by Kenard Pak, because the illustration style reminded me of Jon Klassen with a splash of Brendan Wenzel (Some Bugs). What a treat when I opened the book and discovered that the text is as inviting and intriguing as the rich illustrations! With Flowers are Calling, Rita Gray has created a picture book that flows poetically in paired, rhyming couplets, taking the occasional two-page spread to name the flowers in the illustrations and tell readers where the nectar in each flower is stored, who visits it and how pollination occurs. Flowers are calling a loud blue jay. No, not a jay! He wouldn't stay. Flowers are calling a little moose. No, not a moose! What would be the use? to eat their pollen loose. 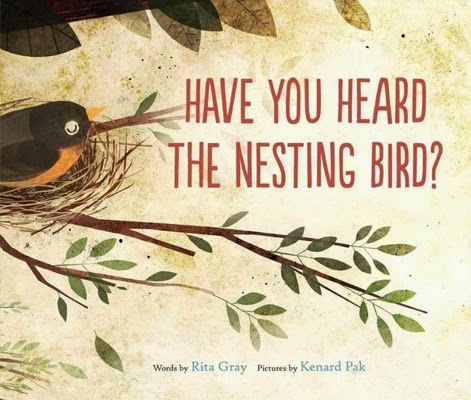 Gray's text is sure to engage readers and pique their interest. Gray even includes flowers that bloom at night and the animals who pollinate them. The final pages of the book invite readers to take a closer look the next time they see a flower growing in nature. Gray describes how color, pattern, shape, smell and time of opening all play a part in how they grow and prosper. A final fascinating facts page includes information like the surprising fact that flowers "make their own electrical buzz that bees understand."